Tamaskan Dog Register Forum • View topic - Tamaskan and small dogs. Hi there! I have a question about Tamaskans and small dogs. 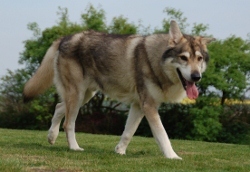 I have recently taken in a Chihauhua, but would like to also get a Tamaskan in about 3-4 years when I move to a place with a big yard. Do you think the Tamaskan would be ok with such a small dog, if he was introduced to him as a puppy, or would there be serious risk to my Chihuahua? Chihuahua will be very well trained and socialised by the time I get a Tamaskan and they will be introduced properly. Has anyone else had a situation like this, introducing a Tamaskan pup to an adult small dog? I don't want to put my small dog at risk when the Tamaskan is a puppy or adult. Re: Tamaskan and small dogs. Hi and Welcome to our forum. 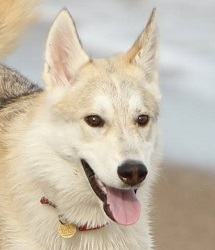 Tamaskan are very friendly and get along with all people, other dogs and children of course if raised correctly. My boy was introduced to my mother-in-laws westie (and other terrier, since passed away) as a pup for precisely this reason... so that he could learn how to interact with smaller dogs while he himself was still small... to be fair the westie still isn't that keen on Dusan because he's a particularly boistrous lad and they only saw each other intermittantly... but there are still enough boundaries/respect between them that the westie is able to let Dusan know if he's pushing his luck (and has never sustained any injuries from their interactions). I have a Tamaskan and a chihuahua cross. The little dog was here first and yes, they get on absolutely fine. Playtime can get a little rambunctious, so I would say that needs supervision but only because of the size difference and weight difference. 42kgs vs 4kgs wrestling matches need a careful eye, no matter how friendly the playing is. My Tamaskan has never shown aggression towards other dogs, but we have worked VERY hard on socialising him from the start.